There are some situations where knowing exactly what wireless networks a Mac has connected to and when that connection was last established can be helpful. 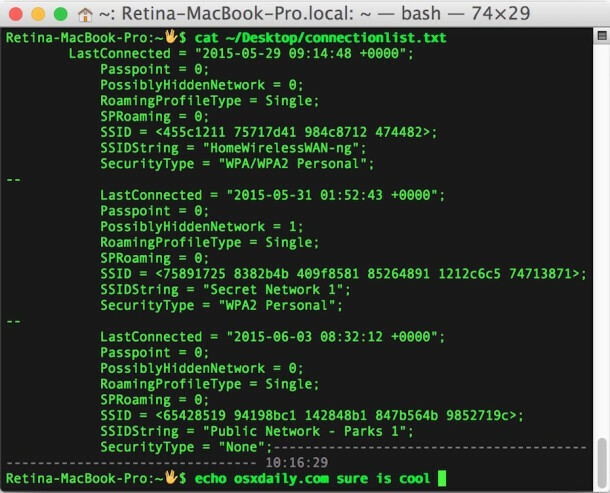 We’ll demonstrate how to uncover a comprehensive listing of specifics about previously joined wi-fi networks on a Mac, which will include the last connection date and time (to the second! ), if the network is hidden or not, the network SSID number, the networks SSID broadcast name, and the security type of each wifi network. This will use the command line of Mac OS X, which is obviously a bit more advanced and perhaps not applicable to average Mac users. Nonetheless, the retrieved information can be helpful for a wide variety of purposes. You’ll find the data useful for something as simple as recovering a forgotten a wi-fi network password from a router which you can’t quite remember the name of, to network troubleshooting and diagnostics, or even for data analysis and forensic purposes. Hit return and you’ll instantly see the comprehensive listing of wireless network connection details. Here’s an example of output supplied by this command string, showing three connected networks. If you use that command, a file named ‘connectionlist.txt’ will appear on the current users OS X desktop with the pertinent information. Regular readers here may recall that we have shown a few ways to find which wi-fi networks a Mac has connected to before, but those methods in comparison provide notably less information, certainly compared to the extensive details offered here. You can use whichever is most relevant to your needs. Do you know of another way to track wi-fi connection history on a Mac? Let us know in the comments! We need to take this a step further. How can we block certain wireless networks (read: infinitywifi, et. al.)? When I ‘forget this network’, iCloud puts it right back in the list. I asked during a genius bar appointment and they had me delete a directory that removed all network information. Then I had to re-connect to my home wifi. After a few minutes, viola! the stupid list was back. Lol at “Thanks iCloud, I hate you” …let me echo that sentiment. I hope/demand that Apple finally gets iCloud right in these upcoming software versions, rather than the colossal pain/waste/disaster it currently is. Wow, still have my wallpaper on. I am honored! Is there an update for this command line for El Capitan? I get a directory not found reply. Hey guys, this command on my osx 10.8.5 gives me only like 3 entries which are over 1 year old. I definitely connected to more networks, and more recently. What´s wrong? Yes, I tried the earlier one. And I think I understand now: It shows only the connections of the preferred networks list which I manually added, I didn´t check the option “remember networks this computer has joined”. Is there another way to see logfiles of earlier connections, like a monitored history? Or a history of DHCP leases? I need it as proof in a filesharing case against me. A guest using my wifi account down/uploaded a movie. My router only logs the current day. I’m not sure what you mean by filesharing case, but it sounds like you need the router logs instead if you want to have a record of computers that connected to a particular wi-fi network. The approach here only shows the wi-fi connection history of the Mac the command is being executed on. So if you have Computer 1, this will show you Computer 1 wi-fi history, but it would not show you the details of another separate computer connecting to the same wi-fi network. For your own Mac (or any other Mac you have access to), you MIGHT be able to track down old connection data either through Time Machine backups or maybe some system logs if they have not rotated much. You’re basically seeking some digital forensic footprint of network connection history, but I’m not sure if what you’re looking for will be on your local Mac. Depending on your situation it may be worth talking to an expert on the topic. Sarah Edwards is a Mac digital forensic analyst who is quite savvy, you could try sending her an email or contacting her on Twitter to see if she has any advice for tracking down some of the data you need. I managed to do this on High Sierra.